Origins was founded in 1990 and is known for their natural skin care products and approximately 2,000 stores globally. They are a big brand linked with Estée Lauder, however, every company has big hits and some mistakes, and an average products like Origins Eye Doctor. No I am not kidding; this an average 2.5 stars product, do you want to know why? Keep reading. 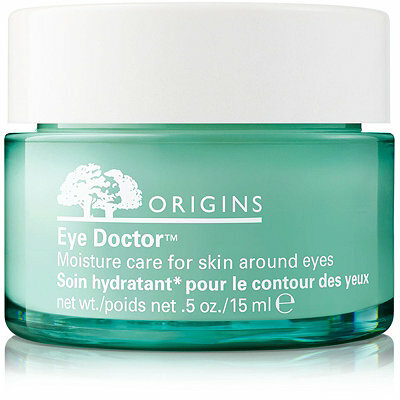 Origins Eye Doctor comes in a blue-green tinted jar, I am concerned about putting my fingers on the cream each time I will use it, and to expose it to the air that will diminish its qualities. A pump would be perfect, but sadly it comes in a jar. The list is very long, and also they indicate in their website that the ingredients may change so better to check the actual product to see what are the current ones. The main ones that I love: Cucumber, Rosemary, Ginseng, and Green Tea Extract. The main ones that I hate: peg-100 stearate, polysorbate 60 (aldough in a very low quantity), peg-4 dilaurate. I applied a fair amount under my eyes, it’s texture was light and sunk in easily but the scent was a little bit irritating for me. Origins Eye Doctor is a really basic eye cream, it doesn’t irritate my eyes, it sinks in and isn’t overly greasy or waxy. However, Origins Eye Doctor does not do anything else besides hydration, nourishes your under-eye area and makes it feel fresh. Does not fade dark shadows, counter crow’s feet, and de-puff. I would say that this is more a preventative thing. I hate the smell of Origins Eye Doctor even when is it is very faint. I firmly believe that an eye cream should not have any fragrance. They claim that Origins Eye Doctor will counteract eye-aging crow’s feet and to fade the look of dark shadows. In my opinion, this a product for people under 30 years if you want to get something to really treat your eyes and you are 30+ keep looking this is not the one. Ingredients: water\aqua\eau; Rosmarinus Officinalis (rosemary) leaf water, Myrtus Communis (myrtle) leaf water; butylene glycol; myristyl myristate; caprylic/capric triglyceride; squalane; glyceryl stearate; tricaprylin; peg-4 dilaurate; Bifida ferment lysate; cetyl alcohol; Vitis vinifera (grape) leaf oil*, gaultheria procumbent (wintergreen) leaf oil*, mentha ravens (field mint) leaf oil*, citrus medical Limonum (lemon petitgrain) leaf oil*, Cucumis sativus (cucumber) oil*, ferula galbaniflua (galbanum) resin oil*, canarium luzonicum (elemi) leaf extract, benzyl salicylate, limonene; aloe barbadensis (aloe) leaf juice; centella asiatica (hydrocotyl) extract; camellia sinensis (green tea) leaf extract; gigartina stellata (algae) extract; hypnea musciformis (algae) extract; cucumis sativus (cucumber) fruit extract; rosmarinus officinalis (rosemary) extract; panax ginseng (ginseng) root extract; tocopheryl linoleate/oleate; caffeine; magnesium ascorbyl phosphate; cetyl ricinoleate; bht; peg-100 stearate; steareth-20; bis-peg-18 methyl ether dimethyl silane; glycerin; dimethicone; carbomer; myristyl laurate; cetearyl alcohol; potassium carbomer; caprylyl glycol; myristyl alcohol; polysorbate 60; hexylene glycol; disodium edta; phenoxyethanol. Whether you are looking for the best face mask for your acne, blackheads, dry, oily, or combination skin, or if you are looking for an anti-aging exercise to help you stay young, the latest hollywood anti-aging secrets, the truth about “superfoods” or anything that has to do with aging, you are at the right place! Big (online) magazines are mostly sponsored. Skincare reviews are not always independent. At bestanti-aging.com our skincare reviews are 100% independent. We have reviewed super popular brands like the glamglow mud mask, but also less well known brands like perricone m.d moisturizer. Or the mudmasky ph-balanced face mask. Conclusion: BestAnti-Aging.com is your #1 resource for independent anti-aging advice, skin care product reviews, serums, anti-aging tips & more!